"This is the best brisket you will ever taste. No matter who comes for dinner, they always make sure that I'll be making this brisket. It is a very traditional dish for Rosh Hashanah and Passover but it certainly is a winner any time of the year for anyone who loves very tender beef." Heat brisket in a large skillet or dutch oven over medium-high heat. Cook until browned on all sides. Stir in water, ketchup, vinegar, onions, garlic, brown sugar, and salt. Bring to a boil, then cover and reduce heat to medium-low. Continue simmering until tender, turning brisket occasionally, 2 hours and 30 minutes to 3 hours and 30 minutes. Remove brisket and allow to cool before slicing the meat against the grain. 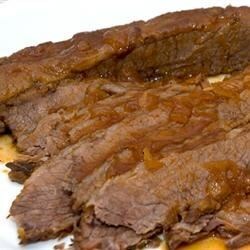 Place brisket slices in a 9x13 inch baking pan or large platter and pour gravy on top. Cover and refrigerate overnight. Remove any excess fat and reheat before serving. This was wonderful. The only changes I made were that I added the onion and garlic while I was browning the meat. I also used chili sauce instead of ketchup. Definitely a keeper.